we just saw the German elections play out. For Germany, this is a huge move to the left – at least in government. They also say that Europe will be strongly supported. I guess that means shoveling money to Brussels and raising it via more and more taxes. Now, I researched everything you wrote about the ride of the right-wing parties in Europe and the separatist movements. I would be interested in your thought on how this plays out. E.g. 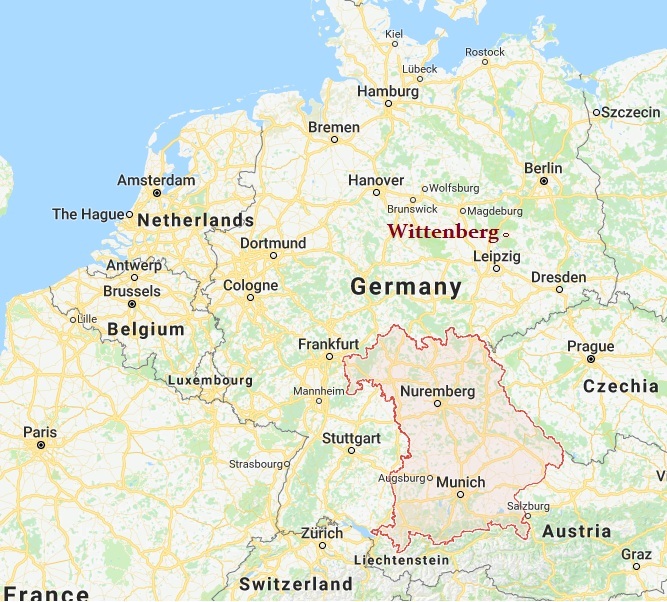 Germany with its left-wing government. It rather seems to be the case that government will become more and more left-wing. Just as in the Weimar Republic. So I do not think that a right-wing could have enough political force to take power, also since Antifa is MUCH more violent and also more powerful than the right. Politicians blame the right for many things, violent events etc, while in fact, it is a rather docile movement with very little power and if so, only in the hands of individuals who do hardly organize since it really is the promotion of individualism vs group-think (left) and group movements. So from a logical standpoint, it seems rather likely to have the socialist agenda gain power. I know you say it is coming to an end. I trust you are correct. Socialism does not work and people might notice at some point. But it seems to be in a quite distant future still. Could you elaborate on that? Will Immigration finally win and move Europe and Germany into a new societal form? Finally, the European left-wingers are actually importing authoritarianism. Which very ironic since they probably think they are importing voters. ANSWER: Oh yes. I do not think most people outside of Germany understand that. Merkel lost control. To keep power, she had to create a Grand Coalition with the SPD, which has been the Northern socialists with origins that go back to the Weimer Republic and the Communist Revolution. The SPD took power for both they and the CDU of Merkel realized that going back to the people would result in both parties losing even more ground. This is highlighted particularly after the Italian election. I have NEVER been asked for a meeting by anyone in the SPD. They have always fundamentally been opponents of anything my computer has forecast. They have NEVER been interested in what is economically best for the people – they are only interested in imposing their will upon the people because they do not see the same light they do. Most people have no idea that Lenin was more of a dreamer who at least thought he was benefiting the people. It was Lenin who warned not to allow Stalin to take power after him. 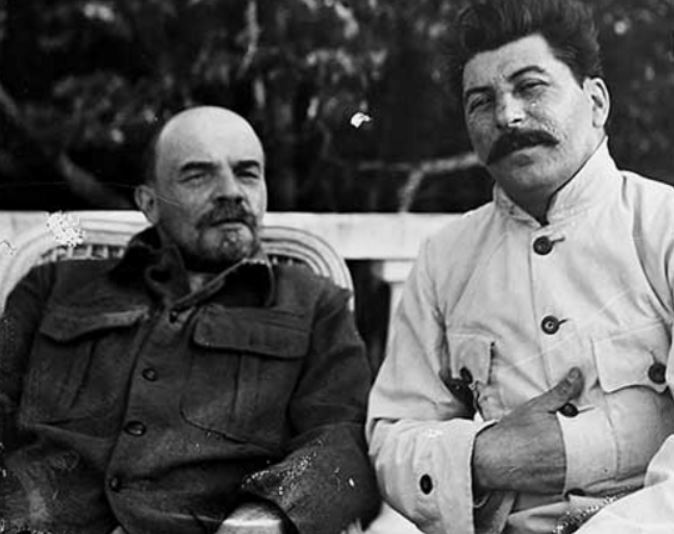 He said: “Comrade Stalin, having become Secretary-General, has unlimited authority concentrated in his hands, and I am not sure whether he will always be capable of using that authority with sufficient caution.” Stalin did everything he could to take power. This has been the curse of the left. They see themselves in a war against the producers and whatever action they take, it is always for the good of the people. This attitude marks the left who always seek to subjugate the right. They never believe in human rights other than their own and have historically always taken an authoritarian position painting themselves as the victim being exploited by the right. The official state records showed that Stalin killed about 2.9 million people. However, this does not include those who died from famine in places like Ukraine for example, which stand at about 7 to 10 million. In Ukrainian, they coined a term for what Stain did – Holodomor (Голодомо́р) meaning “to kill by starvation” has remained at the core of why Ukrainians want independence from Russia. When you look around the globe, what you see is a rising intense fight building between the left v right, i.e. Thieves v Producers in terms of Ann Rand. Simultaneously, we are witnessing the rise of separatism. We see this everywhere. We see in Europe Scotland, Catalonia, Bavaria, Sicily and others. Even in Canada, I wrote about the move of Alberta to secede from Canada. British Columbia is left-wing and environmentalists so they are blocking a pipeline from Alberta through their province. What you see is a trade war within Canada between two provinces. In Germany, we see this sentiment starting to rise in Bavaria which has long retained an underlying sense of nationalism ever since Bavaria was incorporated into the state of Germany in 1871. The old Bavarian palace of the Monarch remains a symbol of Bavarian Nationalism. I remember being in Bavaria when they were celebrating winning the war over the Prussians in the north. The origins of the rise of Bavarian nationalism as a strong political movement emerged from the Austro-Prussian War and its aftermath. Bavaria had always been both politically and culturally closer to Catholic Austria than Protestant Prussia. We see the similar religious strains in Britain as we do in Germany – Protestants in the North v Catholics in the South. Martin Luther nailed his Ninety-five Theses to the church door at Wittenberg. The Bavarians shared with the Austrians a common contempt towards the Prussians, leading Bavaria to ally with Austria in the war. After World War I, in 1923, Bavarian monarchists of the Bavarian People’s Party attempted to seize control of the Bavarian government and declare Bavaria independent of Germany and the Weimar Republic restoring the Bavarian monarchy wherein 1918 the north wanted a Communist Revolution and even asked Russia to come take Germany. This Bavarian separatist coup attempt was then preempted by the then-small Nazi Party which itself attempted to take over the Bavarian government. Bavarian nationalists and the Nazi Party competed for a support base. Finally, the 1932 election saw the Nazi Party won a major victory nationally, yet the Nazis did not surpass the Catholic Bavarian People’s Party in southern Bavaria. The Nazis won only the Protestant areas of northern Bavaria. The underlying resentment remains deep in the heart of Bavaria. In 2013, the Bavaria Party still won 2.1% of the total vote in state elections so they have not faded away. Top officials in the Bavarian sister party of Chancellor Angela Merkel’s conservatives have warned the center-left Social Democrats (SPD) that failure to stick to agreements on migrants could cause the collapse of the potential new German government. Once more, we still see the tensions between Bavaria v the North. Merkel’s Christian Democratic Union (CDU) needs the Christian Social Union (CSU) of Bavaria to even rule. The CSU was formerly the most right-wing party in Germany. But its rubber-stamp of Merkel and the open-door policy to refugees cost them dearly. The AfD won 19.17% of the popular vote in the September 24th, 2017 national election. This was the highest level of support in the former West German states. Here we have a rising new party, Alternative for Deutschland (AfD), which really began in the East and took 12.6% of the national vote. Once again, we see the inner tension between the socialists (SPD) of the North and their quest to forcibly impose their will upon the South. This is the tension of centuries that goes back to the Prussian v Bavaria confrontations that began in religion. The left will make a major stand to seize control globally. They will be VERY OPPRESSIVE and this is what will end up destroying the West as we see the economic epic center move to Asia with China becoming the dominant financial capital of the world. 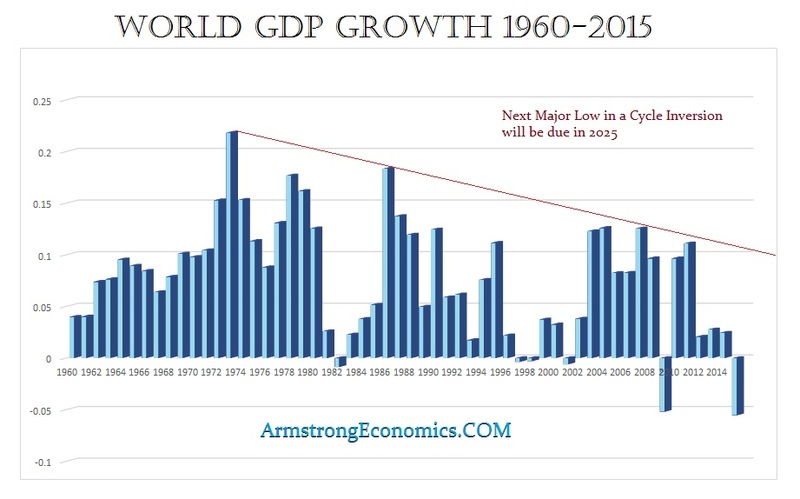 World economic growth (GDP) peaked in 1973. We are looking for the final low to form during 2035.8. The next low will be in 2025 and this will be a Cycle Inversion from a high producing a low. However, you can easily see from this chart of world GDP, socialism is dying. The Pension Crisis will be a major event and the failure of that system will spark not just civil unrest, but the left assaulting the right. The left will look to plunder the wealth of the right and justify it in their minds as they are entitled to this because the right got rich by exploiting the left. This may become excessive between 2029 and 2032. When Rome turned against the producers under Maximinus, this is what really began to destroy the Roman Empire. Informants were rewarded to turn in anyone with assets they believed was hoarding wealth. They turned everyone against everyone else and that broke the bonds of civilization. 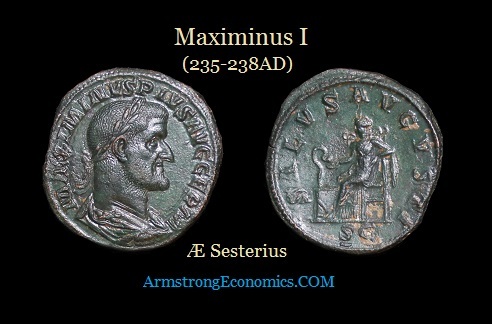 Even after Maximinus was killed by his own troops and his head was sent to the Roman Senate, capital investment NEVER returned. The producers began to invest less and continued to hoard more. Confidence was simply lost and people did not trust one another anymore. This is simply how human nature responds given the same set of circumstances. The more the left seeks to raise taxes and punish the producers, the greater the producers will hoard and not invest and we will see a continued decline in economic growth rates. We can see that we really cannot get world GDP above the 3% level. The decline post-2007 has been profound and 10 years of Quantitative Easing has only caused wealth to contract. Negative interest rates sparked more hoarding of cash even among the middle class. Draghi is holding on for dear life. He has no prayer in hell to restore the economy of Europe. All he has done is kept the governments on life-support. When they cannot sell their bonds, they will raise taxes drastically to try to stay afloat. This is how history repeats. The same circumstances will emerge, but like a Shakespeare play, it can be acted out over the centuries with the only change being the actors. « Repetitive Patterns in the Money Supply – Will Coins Become Extinct?